Visiting our public library is more than going to storytime or checking out books. Our goal was to take the library outside, which is exactly what we’ve done with Explore Outdoors. Opened in September 2012, Explore Outdoors is our new outdoor space at the Anythink Wright Farms public library in Adams County, Colorado. 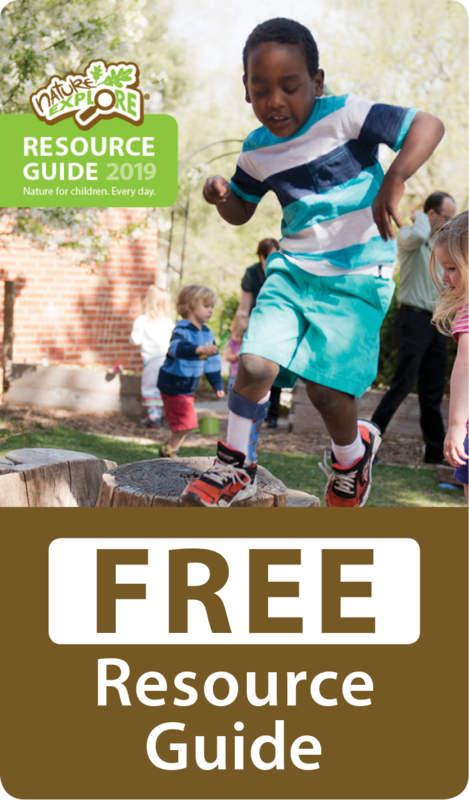 Through Explore Outdoors, families learn about nature in a hands-on experience that proves a trip to the library isn’t just about the books. After two years of planning and seeking funding, Explore Outdoors at the Anythink Wright Farms library became a reality during the summer of 2012. Families watched the construction just outside the windows of the children’s library and couldn’t wait for opening day. Watching the machinery moving logs and rocks was an experience in itself. We held a grand opening in September that was attended by more than 100 children and families. A number of community members such as city council members also joined us at the festive event. A performer engaged children with his repertoire of bug songs. Every area of the space was explored and enjoyed on a warm summer evening. As twilight approached, we heard many pleas asking, “Can we please stay a little longer?” This is a common theme as more and more people discover the space. When a story time or library program is over, the favorite pastime before going home is a visit to the outdoor classroom. 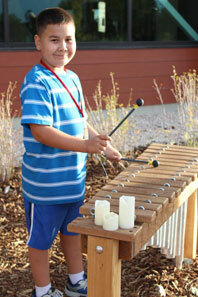 Every day we see children and families enjoying the outdoor classroom. Areas have been called Splash, Create, Climb, Play, Plant and Explore. Kids especially love jumping from log to log in the Explore space and walking through the maze of Climb. In fact, we’ve seen a number of middle school students climbing as if they were a five-year-old again. One of the things we appreciate most is the opportunity for children to take a risk in a safe environment. It’s like a quick trip to the mountains. 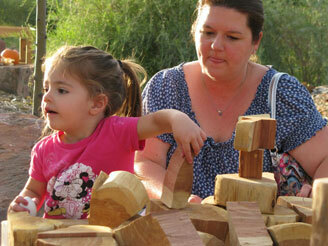 As the bark peels off the big logs, children see nature firsthand. Parents often play with their children, but sometimes a group of parents can be found sitting and chatting on the big rocks watching their children move from area to area. A grandfather brings his grandson to the outdoor classroom every day, rain or shine. The four-year-old always heads straight to the climbing area that he has named “The Fort”. Before they head for home, he always explores another two or three areas. Splash is a highlight of our space as children push the handle of the old-fashioned red pump. When the water magically appears, they are completely amazed. They eagerly keep pumping, watching the water flow into the rocks. A bridge leads to the water feature, creating an added inviting experience. The area was funded through generous contributions from individuals and grants from Adams County Open Space and the Wright Farms Metropolitan District.